The new multi-cam comedy puts shackles on one lead and doesn't bother to do much with the other. 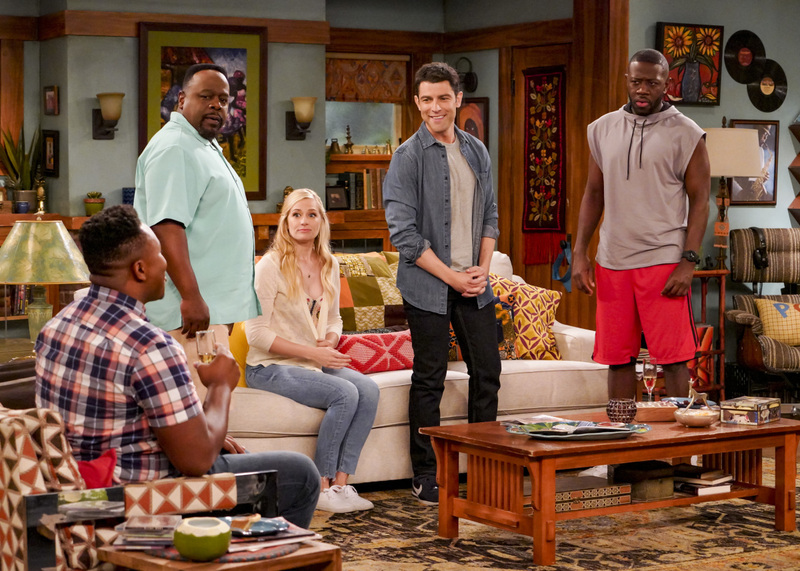 For a simple concept, there’s a lot that’s gone wrong with “The Neighborhood.” The new CBS sitcom about a white Midwestern family who moves to a predominantly black neighborhood in Los Angeles is ostensibly about gentrification. Calvin (Cedric the Entertainer) doesn’t want Dave (Max Greenfield) as his next-door neighbor; he’s scared white folks with money will see an opportunity to “improve” his community and ruin everything the locals have come to love about it. Dave just wants to be a good neighbor. These characters and their concerns are the series’ driving conflict and comedic odd couple, but neither dynamic is effective through four episodes. Creator Jim Reynolds — whose real-life move loosely inspired the series — forces too many one-sided resolutions to look fair for both parties, and shows no indication of knowing how to best utilize his stars. Expecting a nuanced debate over race relations and urban planning on a CBS sitcom is as unlikely as “SNL” choosing tact over fame when hiring guest stars. However, it’s the misuse of Cedric and Greenfield that seems criminal. First off, let’s look at Dave, a proud Michigander and professional conflict negotiator. He’s constantly cheery, sporting a giant grin while bending neighbors’ ears over which of his home state’s many lakes is the very best. (Surprise! Lake Superior isn’t No. 1.) He’s obsessive in his pursuit of instant friendships; when Calvin steps out to get the paper, Dave’s standing behind his front door to say, “Howdy neighbor!” Even his job could be a sham cooked up as an excuse to help Calvin and his sons stop fighting, considering Dave is always home and never does any paid work. In short, Dave has all the traits of a stone-cold weirdo, but Greenfield is trapped playing Dave as a normal dude — and when he’s allowed to be eccentric, Greenfield is at his absolute best. His energy is addictive and his range is as wide as a city block, yet the former “New Girl” star is trapped as a comic straight man. Why not let him off the leash? The show could use that mojo. Though Cedric’s scene brings an additive burst of life — even with the classic grumpy-husband character, natural charisma can go a long way — the rest of the cast is just kind of there. Dave and Calvin’s wives, Gemma (Beth Behrs) and Tina (Tichina Arnold), do what they can with limited screen time, but so far they’re stuck in supporting roles without much character of their own. Jokes in “The Neighborhood” aren’t sharp enough to stand out comedically, nor can it play off bad jokes with a knowing wink. When Dave tries to get Calvin to come to his housewarming party, he says, “Don’t go to the bar and throw darts — come to the party and throw down.” It’s a cringe-inducing line, and the audience knows it; the characters know it. But it’s not clear that the writers do. To its credit, “The Neighborhood” clearly wants to discuss how attitudes have changed in America. Along the lines of successful sitcoms like “Black-ish,” “Fresh Off the Boat,” and “Brooklyn Nine-Nine” — or even the rare, great multi-cam comedy like “One Day at a Time” — the CBS sitcom aims to blend broad jokes about annoying next-door neighbors with more pointed commentary about the country’s racial divide. Dave represents the oblivious white guy whose privilege allows him to be optimistic, while Calvin is the grumpy private type whose experience has taught him to protect his own. Calvin has iron bars on his windows, while Dave gives out his house key to anyone within eyesight from his porch. The first four episodes acknowledge this disconnect enough to make you believe more is coming, and the character dynamics show incremental signs of improvement. For those who love the stars, there’s hope “The Neighborhood” could settle into itself and become a stable sitcom. But the ceiling of this house is closer to a one-story ranch than a spacious villa, making this “Neighborhood” unfit for new tenants. “The Neighborhood” premieres Monday, October 1 at 8 p.m. ET on CBS.